Restrospective policy evaluation scenarios are policy evaluation scenarios employed in ex-post assessments. Ex-post assessments are the present evaluations of past efforts to achieve policy goals throughout all stages of the policy cycle and decision-making context (Figure SPM 2). Ex-post assessments can be based on the straightforward monitoring of variables of interest as well as on a comparison of the achieved change or status with the original targets and the anticipated impacts of the implemented measures. During the policy review stage of the policy cycle, the outcomes of previously adopted policies can be compared to hypothetical counterfactual or alternative scenarios (Table 3.1). Scenarios and models can be used to estimate biodiversity or ecosystem service outcomes under hypothetical policy settings alternative to the ones actually implemented. Ex-post assessments can provide valuable information about how to adjust policy settings with the aim to better achieve desired outcomes in the future, or simply as a form of transparent reporting on the performance of policies or programmes. Figure SPM 2: Restrospective policy evaluation illustrated by a graph of changes in nature and nature’s benefits over time. 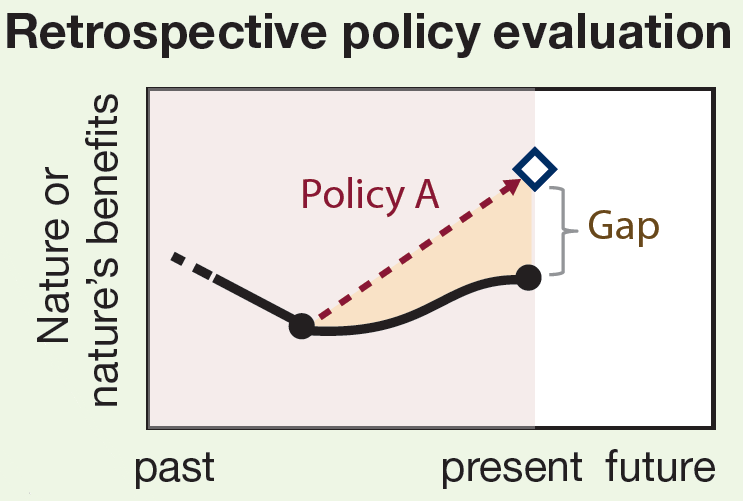 The observed trajectory of a policy implemented in the past (solid black line) is compared to scenarios that would have achieved the intended target (dashed line). Table 3.1: Combining scenario approaches and policy objectives (in the context of restrospective policy evaluation).